Fully Responsive - A fully responsive layout adjusts to any device and screen size. A Wide Range Of Configuration Option - Lots of options for an unlimited number of possible combinations. Unlimited color Option - Able to change text color, background color and transparency etc. Permission settings - Able to set different access permissions for each item. Can I apply a skin purchased from your site to multiple DNN sites? You are allowed to install the skin on an unlimited number of DNN websites(installations), belonging to either you or your clients. However, you shall not resell the skin or offer it for download anywhere on the internet. How to activate modules that come with the skin? Do we need to update our module license after we move the site to a new machine? Yes, you need to send the Machine Key of the module to us again, we will activate it for you. Is your company able to make changes to the skin based on some requirements? We need to develop a responsive skin based on a PSD file. Could you please provide us with a quote? Please send us the PSD files and detailed requirements, we will offer you a quote and explain the issues after checking them. There are Standard, Professional and Enterprise these three options in the product of your site(dnngo), what are the differences between these three options? These three options refer to the license version of modules. You can install the module on a single portal only, belonging to either you or your clients. You can install the module on an unlimited number of Portals under one DNN installation, belonging to either you or your clients. You can install the module on an unlimited number of Portals and DNN installations, belonging to either you or your clients. Are your skin and module compatible with Azure? Yes, it is Azure compatible. If I purchase source code of the module, what can I do with it? 1. You can use the source code in your site or your client’s site countless times according to your needs. 2. You can modify the source code at your options according to your needs. 3. You has no right to release and sell the source code at any place. 4. You has no right to transfer the source code to anyone else for value or for free. 5. You has no right to transfer the expanded products or the source code derived from modifying the Developer’s source code for value or for free. 6. The copyright of the source code belongs to DNNGO. 7. No refund is granted once you purchase it. How can I make the site multilingual? I purchased a DNN Skin from you yesterday, however, I found it is not what I want, could I ask for a refund? Very sorry, if it is not the issue of the product itself after you purchase it, we can not authorize refund. However, based on your situation, we can offer a chance for exchanging other product of the same price. You can select a product you like at DNN Store. How/where can I get the module’s Machine Key? 1. 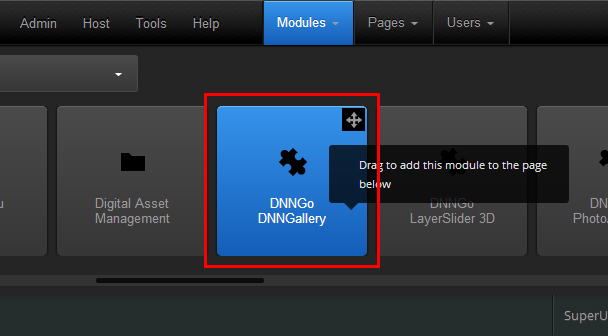 Add the module to the page(please ignore this if you have already done it), as shown in image 1. 2. 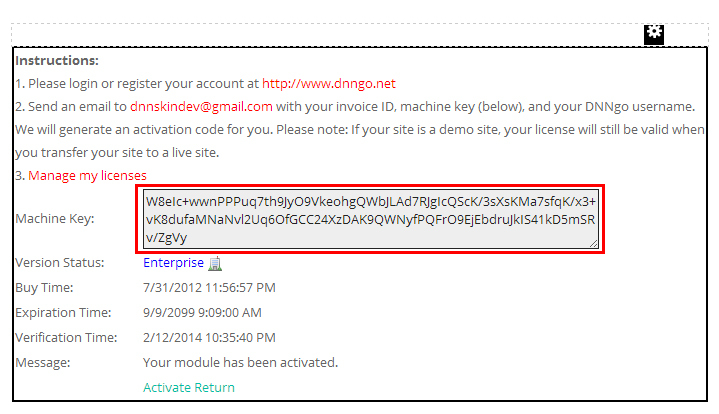 Click the “License ”below the module, go to the module License interface, as shown in image 2. 3. Find the Machine Key option, copy the codes behind the textbox, as shown in image3.